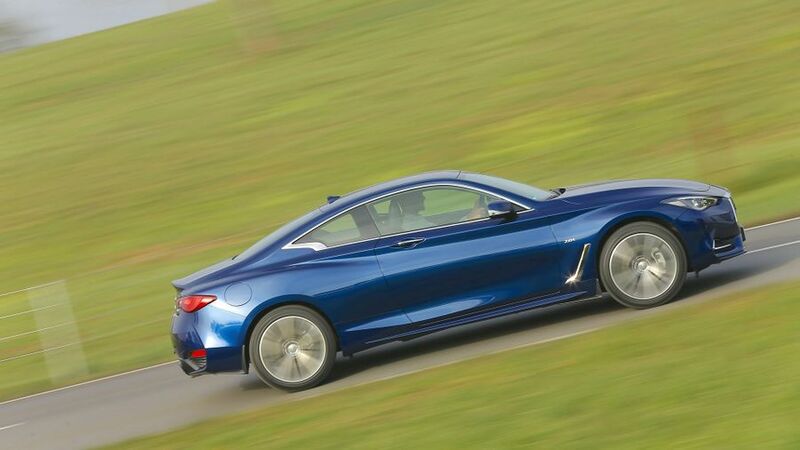 The Infiniti Q60 looks good and is exceptionally well equipped, but in just about every other respect, it’s comprehensively outgunned by rivals like the Audi A5, BMW 4 Series and Mercedes C-Class Coupe. The ride is harsh, the handling is mediocre, the performance is laboured, and it doesn’t match the best for quality, practicality or ergonomics. What’s more, the lofty prices and hefty depreciation mean it doesn’t make financial sense, either. Best to keep your Q60 as cheap as possible. All versions with the smaller engine return the same 41mpg figure. 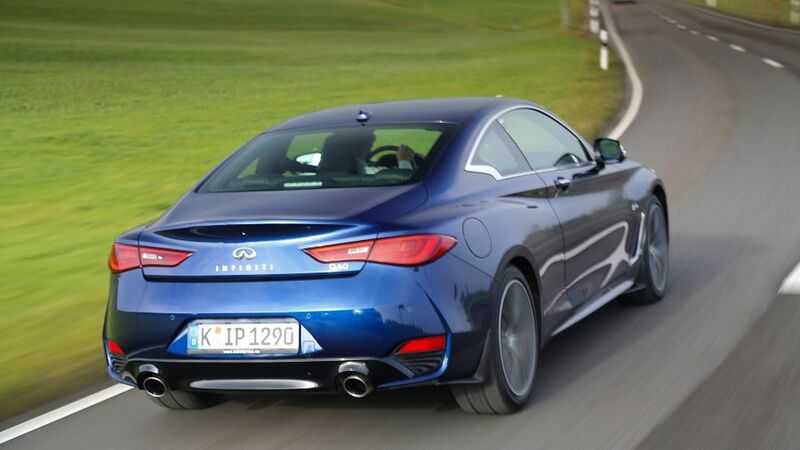 We can only hope the more powerful Q60 is worth the extra over the 2.0-litre. Interested in buying an Infiniti Q60? Swoopy looks are the reason-to-be for any coupe, and on that score, the Q60 does a thoroughly decent job. 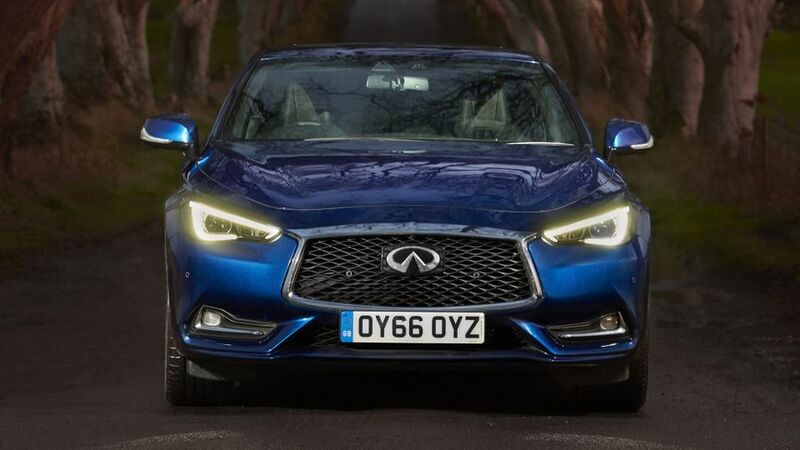 The lines are curvy and the roofline is dramatic, and combined with the bold details (you’ll particularly like the direction indicators that echo the shape of the headlamps, surrounding the white light with orange flashes), the Q60 cuts a very suave and sophisticated figure. All versions come with 19-inch alloy wheels of one design or another, and there’s LED lighting at both ends of the car, along with chromed twin exhausts at the back. Whether it looks better or worse than an Audi A5, BMW 4 Series or Mercedes C-Class Coupe will be a matter of personal taste, but it certainly looks like it belongs. Judge it in isolation, and the quality of the Q60’s cabin looks pretty strong. There’s plenty of stitched leather on show, along with lots of metallic finishes, glossy panels, and even some reasonably plausible-looking wood inlays. It all seems to be very solidly assembled, too. 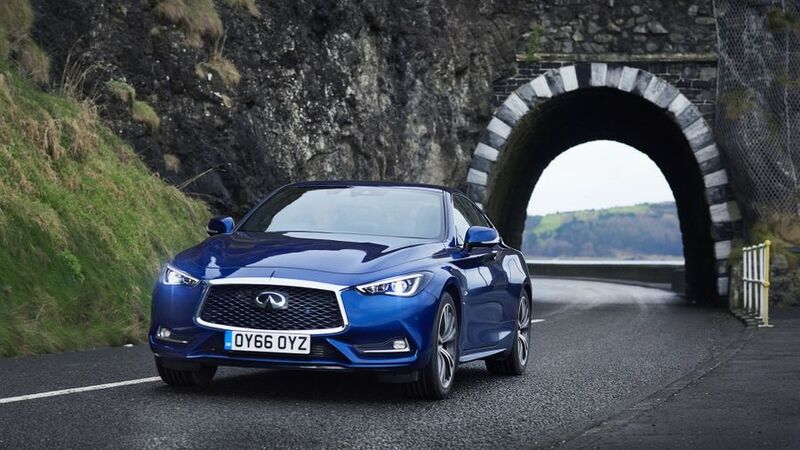 However, compare the Q60’s materials and build with those you find in an Audi or Mercedes, and you realise it doesn’t quite have the lustre, the precision or the sophistication to compete. 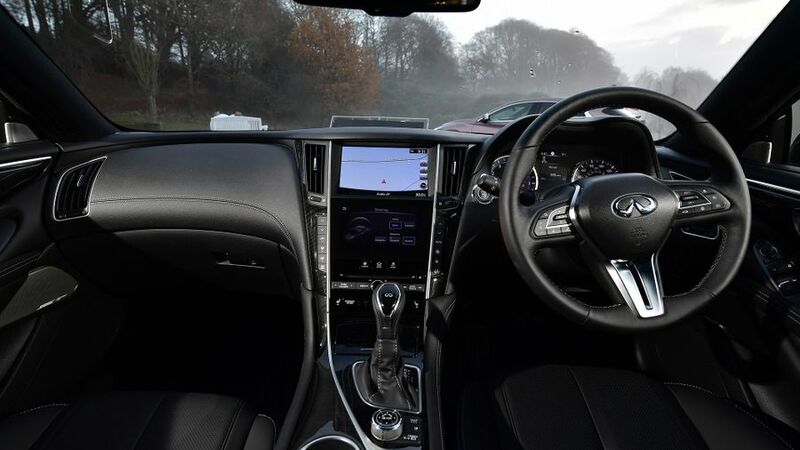 There’s plenty of adjustment for your driving position, and despite the plunging roofline towards the back of the car, your rear visibility isn’t too bad, either. However, some of the ergonomics aren’t quite so successful. 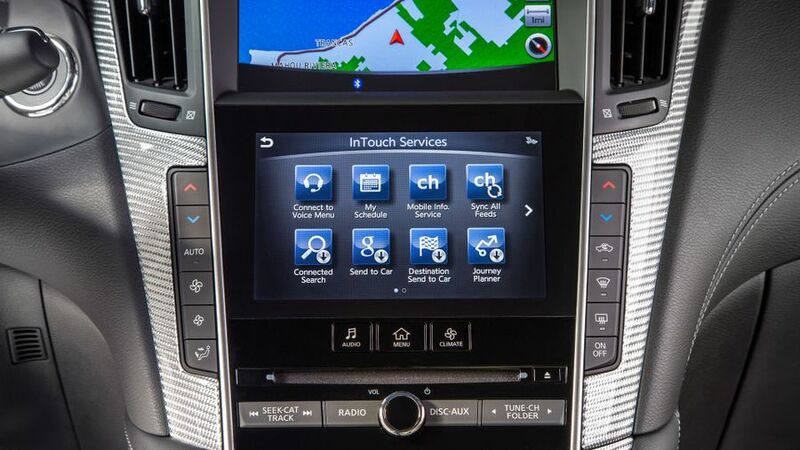 The centre console has two screens, which makes you wonder where you should be looking to operate any given function. The menus used to control various functions could be more logically arranged, too. What’s more, the foot-operated parking brake won’t be to all tastes. Coupes are never the best choice if you regularly carry four people, but the best ones will allow you do so in reasonable comfort from time to time. Unfortunately, the Q60 lags behind its rivals in this regard. There’s lots of space up front, with enough head- and leg-room for tall adults to get comfy. However, while there’s just about enough knee-room for adult-sized legs to fit in the back seats, head-room is in much shorter supply; anyone over five-foot-nine will find the top of their head pressing against the glass of the rear screen. Foot space is pretty limited, too, and because the front seats don’t slide out of the way (the backrests merely tip forward), you have a minuscule space through which to climb in and out of the back. The boot is a half-decent size at 342 litres, but that’s nowhere near what you get in rivals from Audi, BMW and Mercedes, and the space is also a rather odd shape. 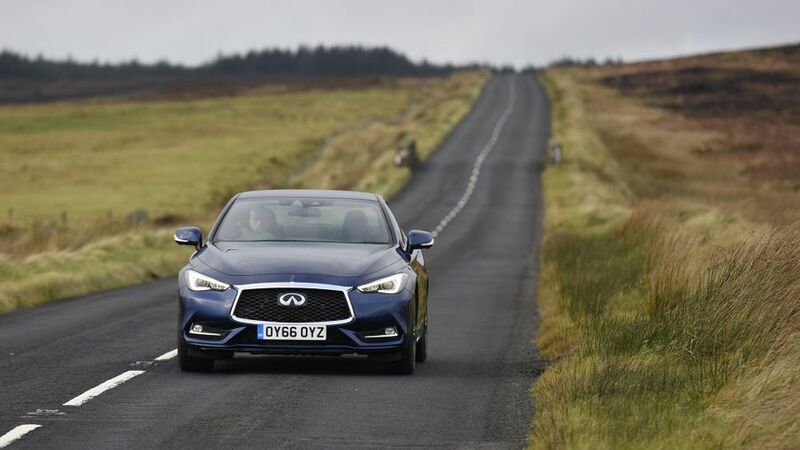 The suspension you get on your Q60 depends on which version you go for: the 2.0-litre car has a standard suspension; while going for the 3.0-litre earns you adaptive dampers. We’ve only tried the 2.0-litre so far, and it’s not all that impressive. It’s rock hard, meaning the car jitters and thumps even on mildly pockmarked roads, and as the surface you’re travelling on gets worse, so does the ride quality. Things improve a little at higher motorway speeds, but even here, this is not a very comfortable car. It doesn’t suppress body lean in the corners as well as it should, considering the harshness of the ride, and the tyres also run out of grip sooner than you’d expect, so Q60 doesn’t even feel that at home on a twisty A-road. The car we drove had an optional steering system that does away with a physical link between the steering wheel and the front wheels, and replaces it with an electronic one. This, too, does the handling no favours. You get virtually zero information about what the front wheels are doing, and the weighting is rather inconsistent. Even worse, once you turn the wheel through the sizeable dead spot around the straight-ahead position, the car turns unnervingly quickly, and that can have you wandering around in your lane unless you make frequent corrections. We can only hope the cleverer suspension and the four-wheel drive you get on the 3.0-litre (the 2.0-litre is a rear-driver) improves matters. 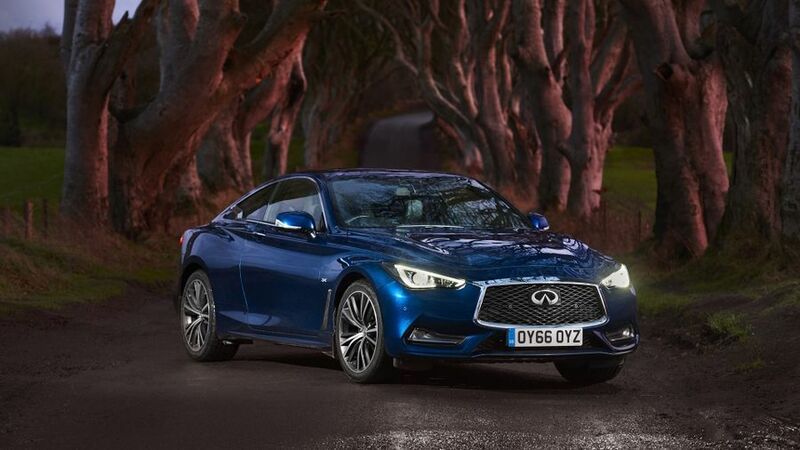 The Q60 is available with a choice of two petrol engines, a 2.0-litre with 208bhp, or 3.0-litre V6 with 400bhp. So far, we’ve only driven the Q60 with the smaller unit, and it’s rather disappointing. Even though it’s turbocharged, you have to really work it to its limits to get it going at anything more than moderate pace. Not only does that leave you short on acceleration for too much of the time, it also makes the engine intrusively noisy. For similar money, rivals from Audi, BMW and Mercedes provide smoother, quieter engines that give you more pace and flexibility. 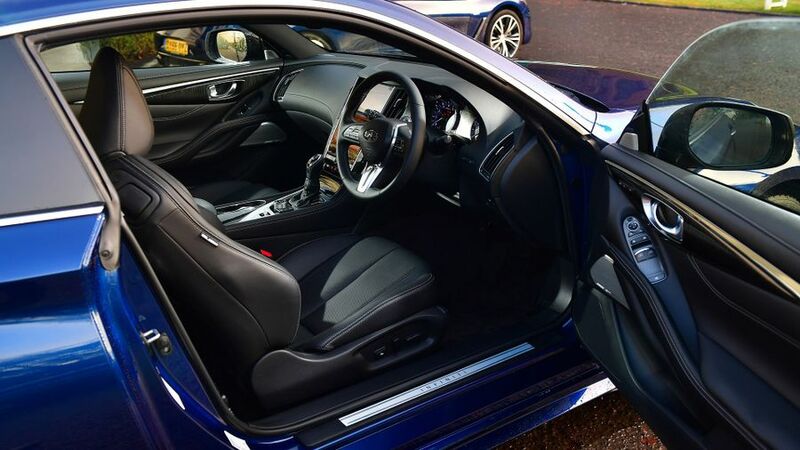 The seven-speed automatic gearbox that comes as standard changes between ratios pretty smoothly, but it’s not all that quick to respond, and it occasionally has to try out a few gears before it finally decides which one it wants to give you. You’d hope that choosing the Q60 over the likely rivals from Audi, BMW and Mercedes would at least save you a good few quid, but alas, it won’t. It costs a very similar amount to the A5 and 4 Series, and only a shade less than the C-Class Coupe. Bizarrely, though, the Lexus RC, with which the Q60 is far more closely matched dynamically, is pricier than the lot of them pound-for-pound. Things only get worse as time goes on, too, because the Infiniti can’t get anywhere near its desirable German rivals on resale values. By the time the average three-year tenure has elapsed, the Infiniti would have cost you considerably more to own. 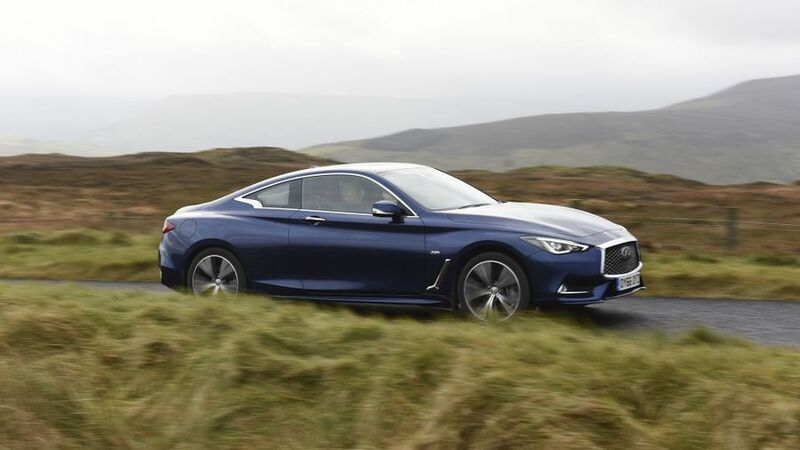 That’s not helped by the fact that the Q60’s fuel economy figures – and as a result, CO2 emissions also – are so far behind those of the German cars, with even the cleanest version achieving an official average of just 41.5mpg. The Q60 isn’t included in the Warranty Direct Reliability Index study, and neither, for that matter, is Infiniti at a brand level. The owner reviews on our website are in very short supply for the Q60, too, which means we have very little data to go on concerning the reliability of the car. You can take solace from the fact that Infiniti is part of Nissan, a brand with a very solid reputation for mechanical dependability, and which currently occupies a top-ten position in Warranty Direct’s manufacturer standings. The three-year/60,000-mile warranty you get is pretty much par for the course. The Q60 hasn’t been tested by Euro NCAP, but every Infiniti that ever has, achieved the maximum five-star rating. We wouldn’t be at all surprised if the Q60 is capable of the same feat, either, because it’s absolutely rammed with safety kit. The six airbags, stability control and tyre-pressure monitoring system you get are nothing out of the ordinary, but all versions also come with autonomous emergency braking with pedestrian detection, lane departure warning, and a pop-up bonnet that helps cushion the impact for pedestrians. Opt for one of the ‘Technology’ models, and you get a further suite of safety systems including adaptive cruise control, blind spot warning, and blind spot intervention. 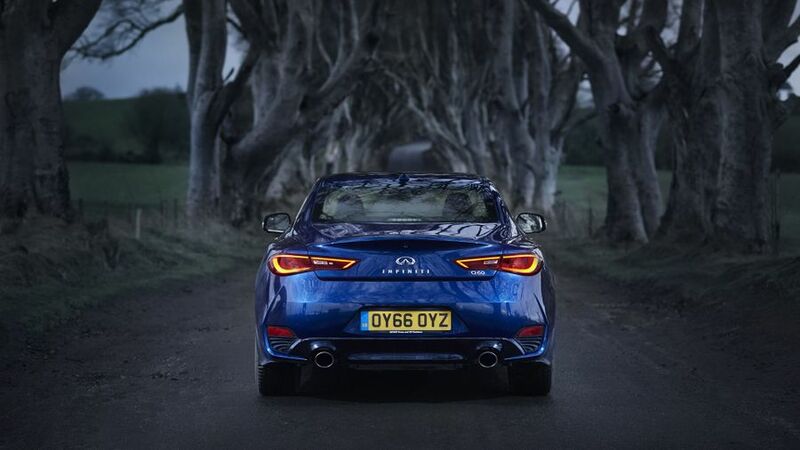 This is one area in which the Q60 can cut it with – and in most cases, surpass – any rival. Even the entry-level Premium trim is packed with luxury toys, including automatic lights and wipers, keyless go, front and rear parking sensors, climate and cruise controls, powered windows, heated leather seats with electric adjustment, and an infotainment system that brings together sat-nav, DAB, Bluetooth and voice control. Sport models get the electric steering system, paddleshifters, aluminium pedals, and a stereo speaker upgrade, but not much else. Specify the Premium Tech or Sport Tech trims, which cost quite a bit more on top, and you’ll also get clever adaptive headlights, all-round parking cameras and memory seats. Because you want to own a four-seat coupe that’s not German, and you’re not all that enamoured with the Lexus RC. Yes, it looks good and it’s very well equipped, but other than that, it’s very difficult to see why you’d choose the Q60 over its rivals, which are better to drive, nicer inside, more practical, and more affordable to own.